Now this is quite a rare and extraordinary computer! Basically the first commercial computer available with a mouse and a GUI! It was the predecessor to the to-become-famous Macintosh. It didn’t get its deserved share of attention though and became a commercial failure since it was too expensive and since it soon competed with its own much cheaper little brother (the Mac). 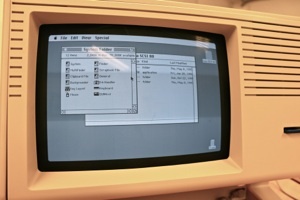 However, it is really a more interesting computer that, unlike the first Macintoshes, was open for expansion (like the Apple II) and came boxed with sufficient memory to actually use it (the GUI demanded much more memory than text based UI). The first Lisa had a strange 5.25” disk drive format (”twiggy”) which apparently had a lot of problems. Soon after the Apple Lisa 2 was released with 3.5” disk drive and an internal hard drive. It’s sometimes called Macintosh XL as well. Most Lisas were upgraded so Lisa 1 are extremely rare. Well, even Lisa 2s are rare and parts for it has become ridiculousy expensive. 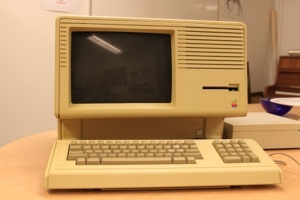 The upgraded Lisa could run the same programs as the Mac (same MC68000 processor) but had initially programs on its own. My Lisa 2 has a swedish keyboard (I’ve never seen that before). Unfortunately the power supply is broken and so I can’t start this beauty. I’ve tried to fix it but it seem to be a bigger problem than the usual leaking electrolyte capacitors but... I hope I manage to fix it soon though.